2019 Summit snowmobiles are designed for long, effortless days of epic riding. Whether climbing steep chutes, carving up bowls of powder, or snaking through tight tree lines, the Ski-Doo Summit instantly responds to the slightest rider input. With crisp, powerful E-TEC engines and features designed to conserve your energy, the ride to the top is as epic as ever! Summit sleds are built to explore beyond boundaries. Their effortless handling, and awesome power let you ride more and go farther than ever before. With four different track lengths (146, 154, 165 and 175 inches) to choose from, and exceptionally responsive Rotax engines powering them, the Ski-Doo Summit will expand your riding horizons. 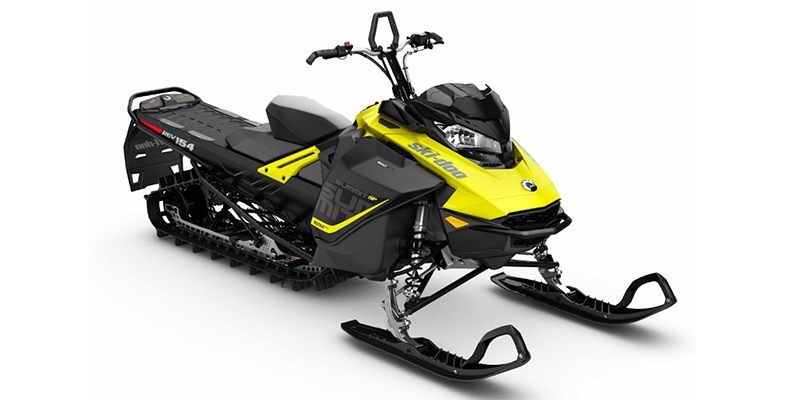 The Ski-Doo Summit SP 850 E-TEC Base is a mountain style snowmobile. Power is provided by a 2-Stroke, 849cc, Liquid cooled, Reed Valve, Horizontal In-line engine with Pull starter. The engine is paired with transmission and total fuel capacity is 9.5 gallons. The Summit SP 850 E-TEC Base comes standard with an One-Piece, 1-passenger seat.